You Can Run a Marathon! : I LOVE My Brooks Trainers! I LOVE My Brooks Trainers! 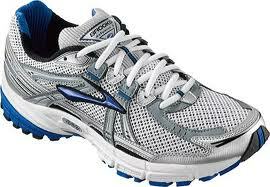 After running in my Brooks around 15 times now I feel like I'm ready to talk about them. These are the best trainers I have found yet!!! My Nike Lunarglides hurt my toes, my knees, and my arches. They had to go and I was so unhappy that I didn't want to use Nikes ever again! My Asics Nimbus 12's were good and I have to admit I was a little scared to change brands but no matter what size I bought in them I'd still end up with squashed toenailess toes! (That doesn't look like a word to me but I think I've earned the right to use it). And the arch support for me is absolutely amazing! From the very first run in these shoes I knew I was going to love them! My knees especially seem very happy about the change. 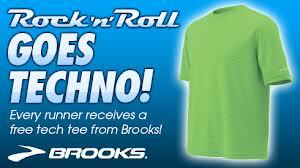 I know that Brooks are a sponsor of the Rock 'n' Roll Edinburgh half marathon so I'm planning on going over with a half empty suitcase and filling it up with Brooks goodies at the expo :-) And the free t-shirt? Yes it's a Brooks! And Spanish is fine as it's helping me get good at reading the language (can't speak it much yet though). I love my Brooks PureFlow. They are the best running shoes I've ever hard. BTW, the RnR Edi expo is very small, you will see. But the landscape is unmatchable. Oh I am jealous! I want to go back!